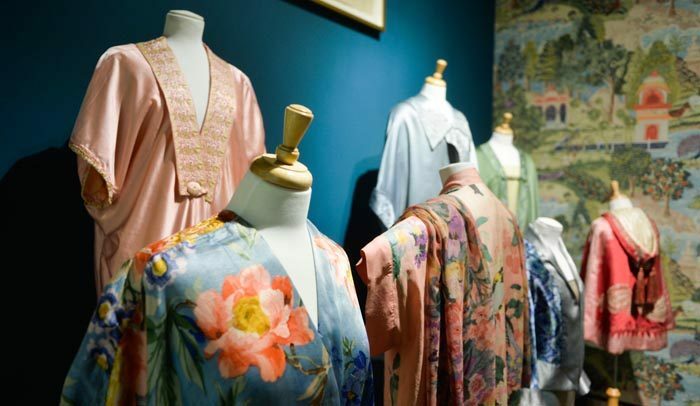 Liberty Kimonos and Capes, 1860s-1930s, silk, Liberty of London © Liberty London. Image courtesy Fashion & Textile Museum. Liberty of London department store, c1925, Regent Street, London. Liberty of London © Liberty London. Image courtesy Liberty London. Agustina wears dress in Prospect Park on Kensington crepe de chine, from an archive design by Bernard Nevill. © Liberty London Fabrics. Image courtesy Liberty London. 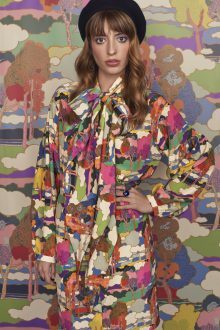 A major retrospective celebrating the innovative retailer and design studio Liberty London and featuring over 100 garments and fabrics spanning over 140 years makes its first visit to Scotland at the Dovecot Gallery. Liberty Art Fabrics & Fashion charts Liberty’s history as a source for key trends in cultural history, including Aestheticism, Art Nouveau, Bauhaus, Pop and Psychedelia. The exhibition presents a historical survey, featuring early garments inspired by the Far East, through to iconic designs of the Swinging Sixties and more recent collaborations with leading British designers. 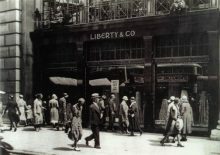 Arthur Lasenby Liberty’s visionary store was established in London in 1875 selling dyed silk fabrics from the Far East, but quickly expanded to become the destination of choice for the discerning fashion buyer. As the Arts & Crafts movement in Britain went international, Liberty traded in imported woven goods, wools and silks from Asia, attracting the attention of artists and innovators of the time including William Morris, Oscar Wilde and Edward Burne-Jones. Unlike Morris, Liberty believed that using industrialised methods to produce textiles was essential in order to make beautiful things available at an affordable price. It was in the district where Morris’ own workshops at Merton Abbey where Dovecot Studios’ founding weavers were trained, that Liberty established a textile print works. Liberty’s pioneering vision to support British design and craftsmanship extended to engage local textile mills to weave cloth and printing firms to create new colourfast dyes, to replicate the popular fabrics he sourced from overseas. Throughout its history, Liberty’s print collaborations with textile and fashion innovators have included Yves Saint Laurent, Loewe, The Vampire’s Wife, Manolo Blahnik and most recently Richard Quinn, and have secured the company’s global reputation as the source and originator of key trends and design revivals. Such is the fame of Liberty that in Italy the Art Nouveau style became known as the ‘Stile Liberty’. Pieces within the collection on display demonstrate the breadth of these designer collaborations which include Scottish designers Jean Muir and Marion Donaldson. Jean Muir (1928-1995), who is known for her Scottish ancestry and whose archive is in the National Museum of Scotland, began her career in fashion as a stockroom assistant at Liberty & Co. in 1950. She worked as a seller and fashion sketcher in the lingerie and Young Liberty sections and Liberty textiles featured in many of her own fashion collections. Tickets Adult £9, Concession £7 (Student, Unwaged, Disabled Person), Art Fund National Art Pass holders £4.50, Under 16 Disabled Person’s carer or companion FREE. All tickets can be booked in advance online at www.dovecotstudios.com and subject to availability may be purchased in person on the day of visit.